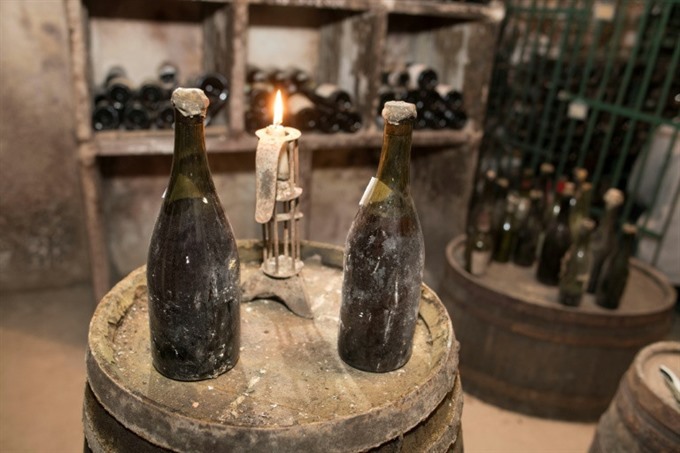 STRASBOURG, France — Tucked away in a vaulted cellar of eastern France for eight generations, they may be the oldest bottles of wine available for purchase: three bottles of "Vin Jaune" (yellow wine) dating from 1774 which will go under the hammer on Saturday. The bigger-than-average 87-centilitre bottles were made by winemaker Anatoile Vercel using grapes harvested under the reign of Louis XVI. They have been kept ever since by his descendants in Arbois, the capital of winemaking in the rolling hills of the Jura region near Switzerland. The three bottles were removed Tuesday ahead of Saturday’s sale in nearby Lons-le-Saunier. "They are the oldest bottles of wines in the world on the market," said Brigitte Fenaux of the Jura Encheres auction house, who will lead the sale. "Having three bottles from this particular year and of such quality is exceptional," said Philippe Etievant of Jura Encheres. A panel of two-dozen wine professionals had already gotten a taste of the bottles at a tasting in 1994, when they discerned notes of "walnuts, spices, curry, cinnamon, vanilla and dried fruits", rating it a 9.4 out of 10.